Not only are giftware branded displays an effective and attractive way to show off the beauty and uniqueness of the wares you have to offer, but they’re also a highly effective way to boost your brand recognition at the same time. Giftware display stands don’t have to be bare-bones, utilitarian pieces. They can be embellished with your company logos, your organization’s carefully chosen color scheme, dynamic design elements that help catch the eye of the customer, and even choice pieces of advertising copy or product information. All of this helps make your custom display an all-inclusive tool that begins building a relationship with your customer right from the first glance. The benefits of incorporating custom display stands into your marketing plans will help boost the overall image of your company as well, not just the appeal of your product. Brand consistency is an excellent way to back up all the hard work you’ve done with the rest of your marketing elements. Highly recognizable logos and brand names are going to make retailers more likely to place your product front and center, as they know their customers will make a beeline straight for it. Ensure the best possible results when you trust the creation of your giftware display stands to professional teams like the ones here at Avante. Avante boasts an impeccable service record when it comes to all sorts of marketing displays and giftware display stands are no exception by any means. Every part of the Avante production process is handled in-house from the initial design phase to the final printing phase so you can rest assured knowing you’ll get great products and consistent results each and every time you order. We offer low minimum production runs ‐ as few as 50 items ‐ so it’s easy to order only as many displays as you need with no overage. Factory direct services eliminate the middle man, so our products go straight from us to you without exception. We pride ourselves on offered premium services at cost-effective price points because we care about your bottom line. Shipping is a breeze to boot, as we always flat-pack our items to ensure courier-friendliness and fast, timely delivery. 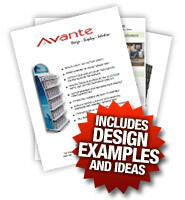 Ordering custom display stands that set your product off to perfection has never been simpler with Avante in your corner. Let us make the difference in your marketing strategy! To find out more about our Giftware POP Displays please click the link to request a Brochure.